Happy April, and welcome to Day 1 of the month-long A-to-Z blogging challenge where many hundreds of folks are posting their way through the alphabet. I love language, especially obscure, strange, wonderful words and I’m also on a mission to be an anchor of loving-kindness, peace, and serenity in these particularly tumultuous and challenging times. So this month I’ll be combining these passions and creating an abecedarium on pronoia, peace and quiety based on unusual words. 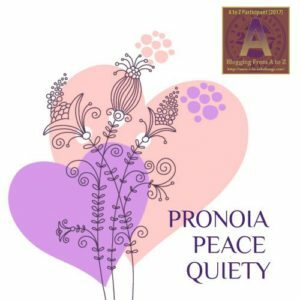 Pronoia is the philosophy based on the belief that the universe is conspiring to shower us all with blessings; quiety means calmness and serenity; and peace of course needs no definition. This concept was fundamental in the teachings of the ancient Greek philosopher Epicurus. He believed the greatest good could be attained by living modestly, gaining knowledge of the workings of the world, and limiting one’s desires. Given the state of affairs currently in our world in which negativity, separation, and service-to-self seem prevalent collective energies, finding our way into ataraxia seems increasingly important. Not only for our personal well-being; but I think it’s helpful when we can hold a sense of calmness and stability when others around us are feeling wobbly. Just reading that is calming, inspiring a slow deep breath. But I think he also brings up another important point that contributes to ataraxia – staying in the present moment. To project ourselves and our energy into the future, or to keep it mired in the past is not being in a state of freedom. It robs us of what we actually have available to us. 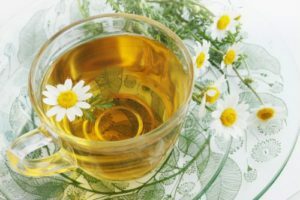 Perhaps you’d like to join me for a cup of tea – chamomile or valerian root are good calming choices. Add in a few slow, deep, gentle breaths and see if you can bring yourself into a moment of tranquility. I invite you to join me as well as an ambassador of ataraxia and help spread it more widely wherever it is needed. Do you have a favorite calm-inducing practice? A favorite tea? An “A” word you’re contemplating today? Do tell – you know I love to hear. I’m a coffee drinker but it still has a peaceful influence on me. Just stopping and breathing in the aroma is enough to turn down the stress a notch or two. I love green tea, but seldom take the time to just enjoy it. Doing that as soon as I finish writing this. I need to breathe – my life is imploding and I need to get a hold of something! Oh Yolanda – wishing you a hardy dose of calm and centering. And may April turn out to be a most fabulous month. I would so love to be in a state of ataraxia … Love this word and I got to learn something new today 😀 Great post! Buddha was really one of the most sensible sages we had. I’m not a tea drinker, but coffee does the trick for me. Ataraxia – a new word learnt today, and kudos on a super start to the A-Z. Thanks Nila. I think we’ll all be needing doses of coffee and tea as we head through the delightful madness that is A-to-Z-ing. I so enjoyed your post today and look forward to more. Thank you for the moment of calm and introducing me to two new words. I’m a jasmine tea drinker, white or green. Fragrant jasmine tea is a wonderful choice Stacy – you’ve inspired me to make a cup. Thanks for stopping by and happy a-to-z-ing! Not much of a tea drinker myself; it makes my heart race, and I prefer coffee. I play solitaire when I need to relax. I’ve played so many games I can make the moves without too much thought, and it helps me clear my mind. Great start to this year’s challenge! It’s good to have those go-to things ready to turn to when we need them. I’m a fan of Mahjong solitaire. Thanks for stopping by John – and for co-hosting the challenge. It’s sure to be a wonderful April for so many of us. I look forward to expanding my vocabulary this month through you. Happy April! Thanks Candace. Wishing you a most fabulous (and not too hot!) April as well. I suddenly feel calm! I must admit I’m drinking a glass of Chateauneuf de Pape ’03 rather than tea! Last year I did a month of short stories employing obsolete and rarely used words. I had great fun. I’m sure your posts will be highly entertaining and informative. Thanks for dropping into Amble Bay! LOL – good choice of relaxants Keith. Looking forward to ambling your way throughout April. Wishing you all manner of peace and calm Hilary – and plenty of doses of delight during April. So happy to be A-to-Z-ing with you and so many other wonderful bloggers. A wonderful idea beautifully written. Not only will you expand our vocabularies, but your ataraxic tone will soothe our hearts. I’m already looking forward to learning a new “b” word. Amazing. I feel both smarter and calmer. Thank you. What kind words Sue – thanks. I’m definitely an equal opportunity tea and coffee drinker, and your Jamaican Blue Mountain brew sounds delish – enjoy! Have a peaceful weekend and happy April. I have heard the word before, but I didn’t know what it means exactly. You’re right. We all need more of it in our lives. Yes, and I believe we can all do our part. Thanks for stopping by, and best wishes with the challenge. Hope you find some ways to create it. Thanks for stopping by, and best wishes with the challenge. Good for you Cait – sounds like a genius solution and glad it helped. Nice connecting again Niki and I’m delighted you’re playing in the challenge as well. We’re clearing in for a fun month aren’t we? Interesting that Epicurus believed in living modestly, and yet the word epicurean has come to be associated with indulgence and luxury. Someone missed the message along the line, maybe? How true Maggie. But I don’t think we can be surprised that given he lived 300 BCE, there might be a fair amount of distortion as his philosophies came to be practiced. Thanks for stopping by, and happy haiku-ing! Good point. I get confused about m own philosophies every day. LOL – I’m right there with you. I don’t drink tea so no favorite calming drink. Fresh air or a walk usually calms me down. I would love to be in a state of ataraxia …..Far away from anxiety and stress of life…. Learnt this word from you today….it’s a great post! Wishing you an April filled with tranquility and lots of fun A-to-Z-ing! Ataraxia–what an intriguing word. It sounds rather harsh, but the meaning of it is quite the opposite, and an excellent goal to strive towards. I drink herbal tea every night as part of my “winding down” ritual. And, yes, I drink it slowly. 🙂 Thank you for the lovely post. A most excellent winding down practice Sara. Just thinking about it is calming. Thanks for stopping by, and I look forward to your continued herbal postings during the challenge. Thank you for that post which is soothing in itself. I have passed your wise words on to Smith, who as a highly stressed but philosophical cat is very keen on finding the right path through life. Oh Curtis, I’m delighted to be in communication with Smith. Please pass on an additional message that frequent naps are just ticket for stress. We’re all very pleased he’s doing the A-to-Z challenge. Stopping by from the A-Z to read your post. I am so happy I stopped by to read. My calm is through meditation, aromatherapy, tea, of course, soothing music and sometimes listening to a sound machine to center and balance myself. Love all your tools and strategies – excellent! And here’s to maintaining a sense of tranquility as we move through the month. Thanks for stopping by and best of luck. I can feel the ease settling in already. 🙂 Happy sipping. My sister leant me a great book called “Sphere of Serenity” – it has a wonderful guided meditaion in it that never fails to help me calm my mind. I think we could all do with finding are way towards ataraxia (new word for me, thank you :)). My favourite tea is green tea with mango and lychee. Both the tea and the book sound like delicious treats Tasha. As I like to say, the road to ataraxia is paved with good practices. 🙂 Thanks for stopping by, and happy April. Thanks Heather – and I appreciate you stopping by. What fun to be participating! Jasmine tea and conversation including unusual words – sounds wonderful Natalie.